Brandon Garner has lived the majority of his life competing against and learning from the best in martial arts, fitness, and self defense. His work ethic, demeanor and commitment to those around him continues to push him to learn and better himself. As a result, his students benefit greatly. It's not everyday you get to train with one of the legendary Royce Gracie's own. 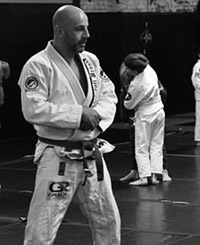 Jason Wingate’s passion is marital arts; he has devoted a majority of his life to the study, practice and teaching of both karate and Gracie Jiu-Jitsu. He is a Black Belt under Brandon Garner. During middle school, Jason began studying traditional karate and by the age of 18 he earned his black belt in Okinawian Go-Ju Ryu. Upon entering college to pursue a biology degree at Radford University, Jason discovered Gracie Jiu-Jitsu and has been practicing ever since. Jason began his tutelage in Gracie Jiu-Jitsu under the now Renzo Gracie Black Belt Tim Mannon. 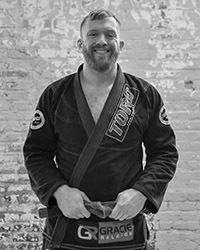 While studying biology at Radford University, Jason dedicated his time to the study of science and Jiu-Jitsu. Jason trained Jiu-Jitsu upwards of five times a week while making the Dean’s list most semesters and graduating with honors. Jason earned both his blue and purple belts under Tim Mannon and the legendary Renzo Gracie while in Virginia. After graduating with a B.S. in Biology from Radford University, Jason moved to Raleigh to pursue a PhD in Biology at North Carolina State University. Jason is presently researching and working on his dissertation. 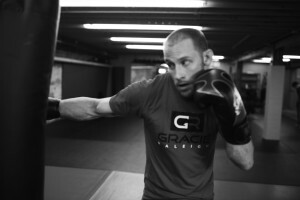 Jason is an active competitor; he has won several advanced no-gi and brown belt divisions. Additionally, Jason is a seasoned referee who has refereed hundreds of Jiu-Jitsu Matches. Lastly, he is a caring and patient teacher who can convey information to students of any level. Blake has been actively competing in sports for nearly his entire life. As an accomplished high school wrestler, he represented Team North Carolina (Freestyle and Greco wrestling) in 2002 and 2003 and earned All-State honors in 2002. He continued to have a successful collegiate career, where he wrestled for Appalachian State University from 2003-2006. Blake's passion for learning and competing did not end after college and he soon began training in Brazilian Jiu-Jitsu, Muay Thai, and kickboxing. He has trained under Scott Francis, John Reese, and Ted Leiner for Muay Thai and kickboxing and Billy Dowey and Jason Culbreth for BJJ. He currently is a Purple Belt under Royce Gracie and looks forward to expanding his knowledge and experience in BJJ. 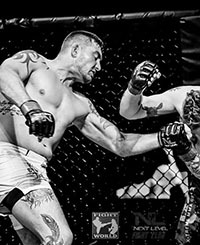 Currently training under Brandon Garner, he is 5-2 (garnering Fight of the Night honors in his fourth fight) in his Mixed Martial Arts career and is known for utilizing his experience in Muay Thai, wrestling, and Brazilian Jiu-Jitsu to develop a hybrid style of fighting efficient for MMA. 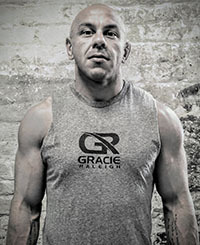 He is excited to be a part of the Gracie Raleigh team and looks forward to helping coach others to success in Muay Thai and MMA, as well as, in their personal life. 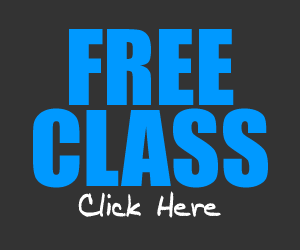 Stuart offers private and small group training for fitness and kickboxing. Stuart’s passion for martial arts began at a young age where he began Shotokan Karate then quickly transitioned to American kickboxing and wrestling through high school. 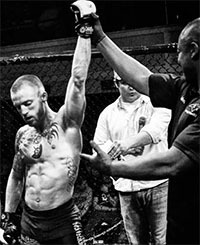 While pursuing a degree in Kinesiology at East Carolina University, Stuart discovered a Muay Thai and Brazilian Jiu-Jitsu school. There he began training in preparation for his first Mixed Martial Arts bout. After graduation in 2012 and becoming a certified Health Fitness Specialist, Stuart moved to Raleigh where he joined Gracie Raleigh to further his passion as a martial artist and coach. He currently is a Purple Belt under Brandon Garner. Stuart is currently 3-1 in his Mixed Martial arts career, training under Brandon Garner. He has developed a striking style cohesive to MMA that focuses on efficiency and fluidity of movement, timing and precision by utilizing his experience in various forms of martial arts. As a strength and conditioning coach he uses a sport-specific approach to improve performance, speed, power, mobility and reaction time. He is grateful to be a part of the Gracie Raleigh team and looks forward to helping others succeed. 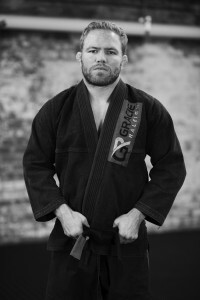 Daniel started training Jiu-Jitsu in 2008 after a friend peaked his interest in the sport. After training for about 3 months, Daniel competed in his first Jui-Jitsu tournament. After the competition, he was hooked and also began taking muay thai. While Daniel’s goal was never to become a fighter, he took his first amateur MMA fight in 2011 after a series of unexpected life events. In mid-2012, Daniel landed at Gracie Raleigh and it’s where he calls home. After nine amateur fights, Daniel went pro in 2014. Taking his last pro fight in 2016 for Ring of Combat in Atlantic City, New Jersey, he decided to retire from fighting to be able to dedicate more time to his family business. As a purple belt under Brandon Garner, Daniel now competes on a regular basis in Brazilian Jui-Jitsu. He holds numerous gold medals in US Grappling and IBJJF tournaments. He has a passion for competing and coaching. He loves being able to pass on knowledge that he has acquired to others. Daniel has been fortunate to train with past and present UFC fighters; such as Josh Koscheck and Jordan Rinaldi. Being a competitor himself, Daniel loves seeing his students succeed, on and off, the mat. Duque fell in love with martial arts when he took his first step into a local MMA school in his home town of Santa Rosa CA. back in 2002. He spent his first three years training at the academy during which he began competing in amateur kickboxing and pankration. Once he realized he had interest in fighting professionally, he made the move to San Diego in hopes to further surround himself with high level talent and training partners. In 2013, Duque moved to NC where he began coaching boxing / kickboxing and has actively been training and competing in Jiu-Jitsu. Aside from combat sports Duque also became involved in teaching combatives with the Marine Corps Martial Arts Program as well as the San Diego Police department. He's also served as a professional body guard and security detail for people of importance. Andrew is currently a Brazilian Jiu-Jitsu Brown Belt studying under Brandon Garner. Andrew started studying Brazilian Jiu-Jitsu in the summer of 2011 while attending the University of Delaware, where he earned a degree in Chemical Engineering. There Andrew met a friend who was studying Brazilian Jiu-Jitsu. The friend introduced Andrew to 302 Brazilian Jiu-Jitsu where Andrew would begin his Jiu-Jitsu journey. After graduating college in 2013, Andrew accepted a job offer and moved to Raleigh. He quickly found a home at Gracie Raleigh. He's put in countless hours on the mats, earning his purple and brown belts under Brandon Garner. 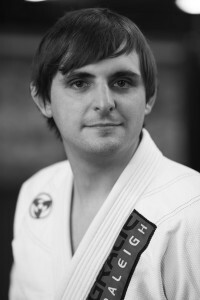 Andrew competes regularly using competition as a means to represent Gracie Raleigh and to improve himself. Andrew’s top priority is to help each student reach their goals while learning the sport and martial art that has changed his and the lives of so many. Amber started her competitive fighting career in 2011 as a boxer. She competed for two years with Duque Dupre amassing a record of 5-2, often fighting up weight classes to find opponents. Due to the difficulties of finding opponents to box against, Amber took up mixed martial arts. She began learning Muay Thai and trained full time in BJJ at Gracie Raleigh beginning in 2016. She received her blue belt in September of 2018 from Brandon Garner. Amber has competed and won gold at numerous BJJ tournaments. Amber began coaching the Gracie Raleigh kids program in 2017. Learning how to coach children and breaking down technique in a way that resonates with them has been a rewarding challenge. 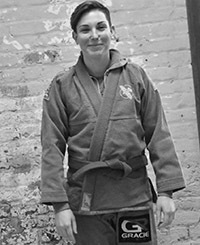 Her Jiu jitsu has improved through coaching her kids, as teaching demands a greater understanding of technique. Coaching adolescents increases her patience, provides another outlet for her passion, keeps her humble, and continues to challenge her to be a better coach and Jiu jitera. Thom started his martial arts journey earning his black belt TKD. He then shifted to study Muay Thai under Scott Francis, earning his instructor rank. He has had the opportunity to train with some amazing coaches and team members over the past 20 years in the Triangle area. He first started training under Brandon Garner in 2012 and is currently a purple belt at Gracie Raleigh. Thom not only coaches the Gracie Kids' program, he is a GR parent as well! His middle daughter, Gabi, has trained with us and his youngest, Alex, is one of our current students. Thom's work isn't finished there. He also works full time as a Regional Sales Manager with Medtronic Neurovascular and graduated from Elon University with a degree in Biology.